Anti-gambling protesters blocked the entrance to the construction site for the SugarHouse Casino along Delaware Avenue on Tuesday, September 29, 2009. SugarHouse announced it will break ground on October 8. More than a dozen protesters who were prepared to "put their bodies on the line" were arrested for blocking the entrance to SugarHouse Casino's construction site Tuesday morning and demanding that the casino leave the waterfront and leave the city. Nine men and five women were arrested. 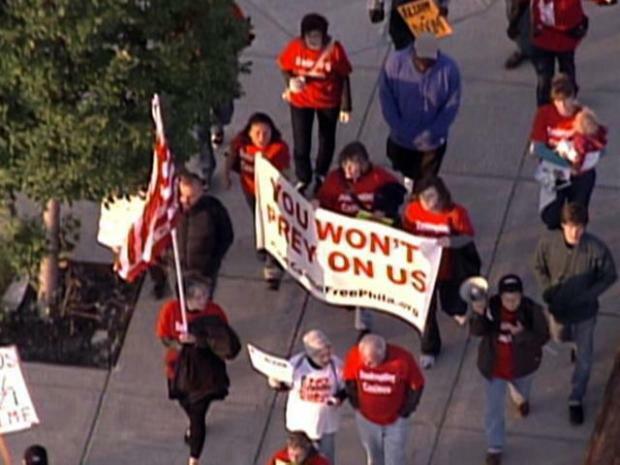 "We've shown Neil Bluhm and SugarHouse, and their friends in Harrisburg, that we're prepared to do what we need to do in order to stop these casinos," said David McKenna, a spokesman for Casino-Free Philadelphia, the group that rallied people to action. SugarHouse announced it will break ground on Oct. 8 to build the slots parlor along Delaware Avenue between Fishtown and NoLibs. Bluhm, a major investor in the casino, expects the first phase with 1,700 slot machines, to be open for business by this time next year. Protesters, who'd been trained in civil disobedience, were well behaved. They ranged in age from 20 to 70, according to the group's attorney, Paul Boni, who said they were also diverse in gender, race and geography -- a good representation of the city's neighborhoods. Their message is that casinos are predatory and the benefits "can never outweigh the social and economic costs from an industry reliant on addiction to survive," according to the group's Web site. A peaceful protest with a "predatory" message. Supporters, including Mayor Michael Nutter, argue that SugarHouse will bring much needed jobs and an infusion of cash to city coffers.